With temperatures in the low 80s and a powerful sun shining brightly through scarce clouds, the first day of fall came in with a hot start. So, too, did Boston College women’s soccer, which started the night off early against the visiting Pittsburgh Panthers. 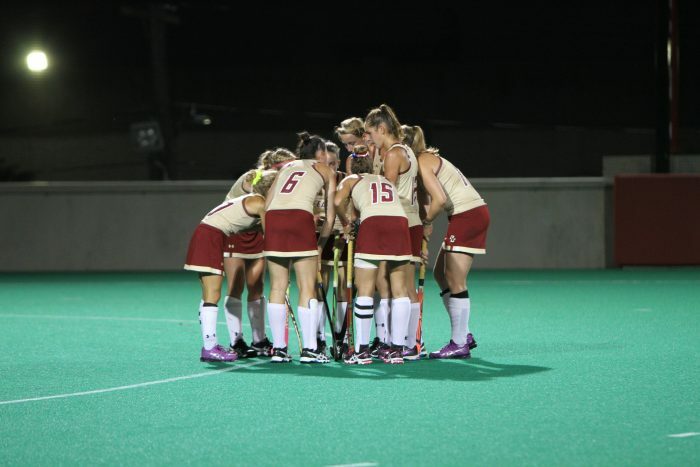 BC’s first strike came within the first five minutes, and it never looked back.The Eagles would score twice more in the game en route to a 3-0 victory over their conference rival. Following a hard-fought loss to conference rival No. 9 Duke on the road, BC (9-1-1, 1-1-0 Atlantic Coast) earned its first win in convincing fashion. In the fifth minute, freshman defender Samantha Hiatt lifted a free kick into the near post finding the head of senior Hayley Dowd, who flicked the ball past Pittsburgh (1-8-1, 0-2-0) goalkeeper Taylor Francis to get the Eagles ahead early. The night, however, belonged to forward McKenzie Meehan. By scoring the third goal of the game, Meehan became BC women’s soccer’s all-time record holder for career points. But, as many athletes are, Meehan was humble and deferred the praise to her teammates after the game. Intent on keeping her team in the driver’s seat, freshman goalkeeper Erin Seppi remained spry, getting off her line quickly to cut out almost all the offensive opportunities Pitt had created in the first half. When she wasn’t cutting out chances prematurely, Seppi showed reckless abandon, repeatedly giving up her body to preserve her shutout. In the 12th minute, Seppi, like a soldier throwing her body on a live grenade, dove in front of a booming shot from point-blank range. The impact echoed through the night air, serving as a reminder to all in attendance that they were lucky not to be Seppi in that moment. Despite a number of seemingly promising chances, the Eagles were held to just the one goal in the first half due to a well-positioned Panther defense. In the 13th minute, Pitt sophomore Alli Higgs dropped to a knee on the goal line to prevent a BC header from crossing the plane at the last possible second. Panther defenders continued to frustrate the BC attack in the second half. They seemed to always be in the right spot at the right time, and were more than willing to put their bodies on the line to protect the goal. Out of 16 shots BC took that didn’t find the back of the net, only two were saved by the Pitt keeper. The majority of the rest found their way into the outstretched legs, heads, and torsos of undoubtedly sore Panthers. While in the first half a majority took action in the middle 60 percent of the field, with both teams struggling to find the right passes to convert in the attacking third, most of the second half was spent on Pitt’s side of the field. Precise execution around the box provided BC many quality opportunities to score in the second half. They finally broke the game open in the 53rd minute, when BC redshirt-junior Lauren Berman found freshman Jenna Bike with a long leading pass. Bike finished off the play with a superb diving finish into the corner of the net. Meehan’s record-setting goal provided the perfect exclamation point on a convincing victory for BC. The win is the Eagles’ first conference victory of the year, and their ninth in the first eleven games. After the game, head coach Alison Foley stated that she was pleased with the way the team is coming along. The Eagles will look to continue their conference campaign in Louisville this Saturday. Meehan will attempt to extend her point streak to 10 straight games and separate herself from the rest of the pack, cementing herself as one of the most prolific soccer players in the history of the program. As for Foley, she’s just soaking in Meehan’s greatness while she still has the chance.